The Australian experts say they have addressed two fundamental questions facing those championing coral reef preservation. “We needed to objectively identify coral reefs that are relatively less vulnerable to climate change and are better positioned to help the regeneration of other reefs in the future,” said University of Queensland Global Change Institute Director Professor Ove Hoegh-Guldberg. Scientists predict that even if global warming is limited to 1.5°C by 2050, coral reefs are still likely to decline by as much as 70-90 per cent. “Our strategy focuses on well-connected coral reefs that have the best chance of surviving projected climate change as defined in the Paris Agreement,” Professor Hoegh-Guldberg said. By applying modern portfolio theory, a mathematical technique used in the world of finance, scientists have been able to account for some of the climate uncertainty. This reduces the risk of widespread failure across a given portfolio, with only a small impact on the expected benefits. With the assistance of portfolio theory, the scientists have identified 50 sites that are likely to provide a good return on investment for long-term coral reef preservation. The scientists argue the global community should strengthen existing conservation and invest in new efforts across sites that include 500 km square selections of coral reef in French Polynesia, Brazil, Caribbean, East Africa, Coral Triangle and the Great Barrier Reef. A quantitative ecologist involved in designing the mathematical algorithm used to identify the reef areas, UQ’s Dr Hawthorne Beyer, said the new initiative did not detract from the many other worthy reef conservation projects under way around the world. “It complements them,” Dr Beyer said. “There are still many measures we can implement to improve the plight of these and other coral reefs. 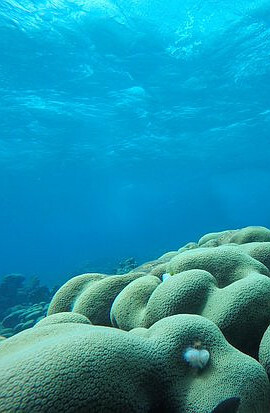 The team that developed modern portfolio theory for coral reef conservation also considered some of the many novel adaptation technologies being proposed around the world. Professor Hoegh-Guldberg said these novel solutions could take years or decades to develop. “Many of these new technologies also come with significant risks,” he said. UQ’s Dr Emma Kennedy said the recent IPCC special report into Global Warming was emphatic in its advice regarding the future of coral reefs around the world. “The planet is warming, it has already warmed by one degree since pre-industrial times, and we are continuing to track towards two degrees,” she said.